Monsters University is a 2013 American 3D computer-animated comedy film produced by Pixar Animation Studios for Walt Disney Pictures. It was directed by Dan Scanlon and produced by Kori Rae, with John Lasseter, Pete Docter, Andrew Stanton and Lee Unkrich as executive producers. The music for the film was composed by Randy Newman, making it his seventh collaboration with Pixar. It is a prequel to Monsters, Inc. (2001), making it the first time Pixar has made a prequel film. Monsters University tells the story of two monsters, Mike and Sulley, and their time studying at college, where they start off as rivals, but slowly become best friends. John Goodman, Billy Crystal, Steve Buscemi, Bob Peterson, and John Ratzenberger reprise their roles as James P. Sullivan, Mike Wazowski, Randall Boggs, Roz, and the Abominable Snowman, respectively. Bonnie Hunt, who played Ms. Flint in the first film, voices Mike's grade school teacher Ms. Karen Graves. Disney, as the rights holder, had plans for a sequel to Monsters, Inc. since 2005. Following disagreements with Pixar, Disney tasked its Circle 7 Animation unit to make the film. An early draft of the film was developed; however, Disney's purchase of Pixar in early 2006 led to the cancellation of Circle 7's version of the film. A Pixar-made sequel was confirmed in 2010, and in 2011, it was confirmed that the film would instead be a prequel titled Monsters University. Monsters University premiered on June 5, 2013 at the BFI Southbank in London, England, and was theatrically released on June 21, 2013, in the United States. It was accompanied in theaters by a short film, The Blue Umbrella, directed by Saschka Unseld. The film grossed $744 million against its estimated budget of $200 million, making it the seventh highest-grossing film of 2013. An animated short film titled Party Central, which takes place shortly after the events of Monsters University, premiered in fall 2013 before being released theatrically with Muppets Most Wanted in 2014. Michael "Mike" Wazowski, a young monster, aspires to become a scarer – a monster who enters the human world at night to scare children and harvest their screams for energy – after visiting Monsters Incorporated, Monstropolis' most profitable scaring company, on a school field trip. 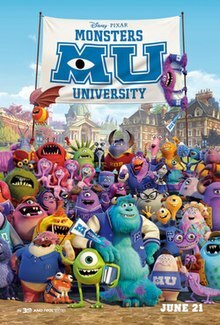 Eleven years later, Mike is a first-year scare major at Monsters University, where he meets James P. "Sulley" Sullivan. Mike studies hard, while the privileged Sulley, coming from a family of talented scarers, relies only on his natural ability and begins to falter. As the semester progresses, Mike and Sulley attempt to join a fraternity, but only Sulley is accepted into Roar Omega Roar, the most prestigious fraternity on campus. At the semester's final exam, a fight between the two causes them to accidentally break Dean Abigail Hardscrabble's cherished Scream Can. Hardscrabble fails them both on the spot, citing Sulley's laziness and Mike's complete lack of scariness; Roar Omega Roar then expels Sulley. Wanting to prove himself, Mike enters the university's "Scare Games", and makes a wager with Hardscrabble: she will reinstate him and his team to the scare program if they win, but Mike must leave the university if they lose. He joins a fraternity of misfits named Oozma Kappa, but they are denied entry to the Games for being one team member short, so Sulley joins them, seeing the competition as his way back into the scare program. Oozma Kappa finish last in the first challenge, but are saved from elimination when another team is disqualified for cheating. Oozma Kappa improve gradually due to Mike's training and intricate knowledge of scaring, and they advance through each following challenge, finishing second to Roar Omega Roar. In the final round, they defeat Roar Omega Roar with a decisive final scare by Mike in the simulation bedroom. However, Mike soon discovers that he only won because Sulley secretly rigged the machine to give Mike a maximum score. Determined to prove that he can become a scarer, Mike breaks into the school's door-making lab. He enters a door to the human world, but finding himself at a summer camp in a cabin full of children, is forced to flee into the woods. Meanwhile, Roar Omega Roar offers to reinstate Sulley, but he declines, instead confessing to Hardscrabble that he cheated just as she is alerted to Mike's break-in. Hardscrabble forbids anyone else from going through the door, but Sulley sneaks through to rescue Mike. After reconciling, they try to return, but are unable to exit after Hardscrabble deactivates the door while waiting for the authorities to arrive. Pursued by camp rangers, Mike realizes that the only way to escape is to generate enough scream energy to power the door from their side. Working together, Sulley and Mike terrify the camp rangers and generate an overwhelming amount of scream energy, returning to the lab seconds before the device overloads and explodes in front of a surprised Hardscrabble. Mike and Sulley are expelled from the university as a result of their actions, while the other members of Oozma Kappa are accepted into the scare program for the next semester, as Hardscrabble was impressed by their performances in the Games. As Mike leaves on the bus, Sulley runs after him to raise his spirits. Hardscrabble then appears and wishes them good luck, claiming they were the first students to have surprised her. Some time later, the two find jobs at the mail room of Monsters, Inc., eventually working their way up to join the scare team. Billy Crystal, John Goodman, and Steve Buscemi (top) reprise their roles from Monsters, Inc. while Helen Mirren, Nathan Fillion, and Alfred Molina (bottom) play new characters. Plans for a second Monsters, Inc. film existed since 2005. Following disagreements between Disney CEO Michael Eisner and Pixar CEO Steve Jobs, Disney—which owned the rights to make sequels to all of Pixar's films up to Cars—announced that a sequel to Monsters, Inc. would be made by Circle 7 Animation, which was also working on early drafts of Toy Story 3 & Finding Nemo 2. Titled Monsters, Inc. 2: Lost in Scaradise, the film would have focused on Mike and Sulley visiting the human world to give Boo a birthday present, only to find that she had moved. After getting trapped in the human world, Mike and Sulley would split up after disagreeing on what to do. Screenwriters Rob Muir and Bob Hilgenberg were hired to write a script for the film, and storyboarded an early draft of it. Disney's change of management in late 2005—in which Eisner was replaced by Bob Iger—led to renewed negotiations with Pixar, and in early 2006 Disney announced it had purchased the studio. The Disney-owned sequel rights were then transferred to Pixar, leading to the cancellation of Muir and Hilgenberg's version of the film and the subsequent closure of Circle 7. A Pixar-made sequel was confirmed in 2010. The film was originally planned for release on November 16, 2012, but the release was moved up to November 2, 2012 to avoid competition with The Twilight Saga: Breaking Dawn – Part 2. On March 29, 2011, it was confirmed that the film would be a prequel and the title Monsters University was announced. On April 4, 2011, it was confirmed that the film will be released on June 21, 2013. Director Dan Scanlon (left) and producer Kori Rae (right) screened the film at the 2013 Annecy International Animated Film Festival. The feature was directed by Dan Scanlon and produced by Kori Rae. Billy Crystal, John Goodman, Steve Buscemi, Bob Peterson, and John Ratzenberger reprised their roles, and Bonnie Hunt voiced a new character. New voice cast included Dave Foley, Sean Hayes, Julia Sweeney, Helen Mirren, Alfred Molina, Peter Sohn, Charlie Day, Joel Murray, Nathan Fillion, Aubrey Plaza, Tyler Labine, John Kransinski, Bill Hader, Bobby Moynihan, and Beth Behrs. The plot of Monsters University details Mike and Sulley's first meeting, but this created a continuity error from the first film in which Mike tells Sulley "You've been jealous of my good looks since the fourth grade." Director Dan Scanlon said he had a dilemma with this line during pre-production, but he believed it was best if Mike and Sulley meet in college because, "we wanted to see their relationship develop when they were adults. And we also felt like college is so much about self-discovery and figuring out who you are." He added, "It felt like the perfect place to do this, but we had that line. So we tried versions where they met young and then we skipped ahead to college. And we knew we didn't want to make Monsters Elementary." Scanlon said during pre-production that, "Pete Docter, the original director, and John Lasseter ... finally said to me, 'it's great that you're honoring that, but you have to do what's right for the story.' So we made a tough decision to just have them be in college and put that line aside." Scanlon later retconned the line from the first film as "an old monster expression", saying that "it’s what monsters always say to each other." Monsters University is the first Pixar film that used global illumination, a new lighting system introduced as part of the overhaul of the rendering system used since the first Toy Story film. In the planning stage of the film, director of photography, Jean-Claude Kalache, asked "What if we made these lights just work?" Before the new system, artists had to build reflections and shadows manually, which became increasingly complex as the models and the setups became more technologically advanced. The new lighting system uses path tracing, a technique that imitates the behaviour of the light in the real world; this automatized the process, delivered more realism, produced soft shadows, and let the artist spend more time on models and complex scenes – some of which contained thousands of light sources. For research, the filmmakers visited several colleges in the U.S., including Harvard University, Stanford University, UC Berkeley, and the Massachusetts Institute of Technology, observing college architecture, student life, Greek organizations, and the teaching methods of professors and faculty. To research fraternity life, which is central to the film, many of the film's producers spent several weeks at a fraternity house. Researchers also attended a "Bonfire Rally" at Berkeley in anticipation of the Big Game, a rivalry football game between the university and Stanford. The music for the film is Randy Newman's seventh collaboration with Pixar as composer. Walt Disney Records released the soundtrack on June 18, 2013. The songs "Main Title", "Rise and Shine", and "The Scare Games" feature the drum line from the Blue Devils group "BD Entertainment". The recordings for the percussion tracks were done at Skywalker Ranch, and were written by Blue Devils Percussion Caption Head Scott Johnson. The songs "Island" by Mastodon and "Gospel" by MarchFourth Marching Band are featured during the film but do not appear on the soundtrack. The songs "Party Hard" by Andrew W.K. and "Kickstart My Heart" by Mötley Crüe are featured prominently in the teaser trailers but do not appear on the soundtrack or in the film. All music composed by Randy Newman, except where noted. The first teaser trailer for Monsters University was released on June 20, 2012. Four versions of the trailer exist; in his sleep, Mike mutters excuses to avoid attending class in each one, such as "I'm not wearing any clothes," "My homework ate my dog," "Class President? ", and "My pony made the Dean's List." A second trailer was released on February 11, 2013, a third on April 26, 2013, and a fourth and final trailer, which included scenes from the film, was released on May 30, 2013. On October 8, 2012, Pixar revealed a fully functional website for Monsters University, complete with information about admissions, academic and campus life, and a campus store to purchase MU apparel. On April 1, 2013, the website was styled to appear as though a rival college, Fear Tech, had hacked and vandalized it. The first television commercial for the film was aired during the 2013 Rose Bowl Game, parodying advertisements for participating schools that are shown during college football telecasts. From June 27 until July 11, 2013, Disney's online game Club Penguin hosted a Monsters University Takeover event to promote the film. Players could dress up as their favorite monsters and take part in the Scare Games. The film had its worldwide premiere on June 5, 2013, as a special screening at BFI Southbank in London with the director and producer in attendance. The film had its Asian premiere as the opening film of the 2013 Shanghai International Film Festival on June 15, 2013. It premiered in the United States on June 8, 2013, at the Seattle International Film Festival, and was released in theaters on June 21, 2013. The film's theatrical release was accompanied by Pixar's short film titled The Blue Umbrella. Monsters University was released by Walt Disney Studios Home Entertainment on Blu-ray, 3D Blu-ray, DVD, digital copy, and on demand on October 29, 2013. It was accompanied by The Blue Umbrella, Pixar's short film which played alongside the film in theaters. Monsters University earned $269.5 million in the United States and Canada and $475.7 million in other countries, for a worldwide total of $744.2 million. Calculating in all expenses, Deadline Hollywood estimated that the film made a profit of $179.8 million. It is the 56th-highest-grossing film of all time, the 12th-highest-grossing animated film all time, the seventh-highest-grossing 2013 film, and the third-highest-grossing Pixar film. The film earned $136.9 million worldwide on its opening weekend. Disney declined to provide a budget for the film; Entertainment Weekly speculated that it was higher than that of Brave ($185 million), mainly because of the high cost of John Goodman and Billy Crystal reprising their roles. Shockya and EOnline reported the budget to be $200 million—on par with previous Pixar films. In the week leading to Monsters University's release, Disney projected an opening-weekend gross of at least $70 million. The film opened on Friday, June 21, 2013 across 4,004 theaters in first place with $30.47 million—including $2.6 million in 20:00 Thursday night shows—marking the fifth-largest opening day among animated films. The film then reached first place with an opening-weekend gross of $82.43 million; the second-largest among Pixar films, the second-largest among G-rated films, the fourth-largest among prequels, the fifth-largest among animated films, and the fifth-largest among films released in June. Monsters University remained at first place on its second weekend, declining 45% to $45.6 million. Facing tough competition from Despicable Me 2 on its third weekend, it dropped 57% to $19.7 million. As of December 2013, it is the tenth-highest-grossing animated film. The film earned $54.5 million in 35 markets on its opening weekend. It set a Pixar opening-weekend record in Latin America with revenues of $31.7 million. In Argentina, the film set an opening-weekend record among all films with $5.49 million. In Australia, where it had a simultaneous release with Despicable Me 2, Monsters University debuted behind the latter with $3.56 million in third place. In Hong Kong, the film set opening-day (HK$5.03 million), single-day (HK$7.93 million) and opening-weekend (HK$25.79 million) records among animated films, beating the previous record holder, Toy Story 3. In the UK, the film topped the box office during its opening weekend with a gross of GB£3.46 million. The film's largest opening occurred in China, where its $13 million debut ranked fourth among Disney films. The film's highest-grossing markets are Japan ($90.1 million), the UK, Ireland, and Malta ($47.2 million), and Mexico ($37.6 million). Review aggregation website Rotten Tomatoes gives the film a score of 80% based on 196 reviews with an average rating of 6.8/10. The site's critical consensus reads "Offering Monsters, Inc. fans a welcome return visit with beloved characters, Monsters University delivers funny and thoughtful family entertainment for viewers of any age." Another review aggregator, Metacritic, which assigns a rating out of 100 top reviews from mainstream critics, calculated a score of 65 based on 41 reviews, indicating "generally favorable reviews". Audiences polled by Cinemascore gave the film a grade A. According to Disney, audiences were 56% female and 60% below the age of 25. Families made up 73% of business, and teens accounted for 15%. The film played well with all ages. Matt Zoller Seitz of Chicago Sun-Times gave the film four stars out of four, saying it "is true to the spirit of [Monsters, Inc.] and matches its tone. But it never seems content to turn over old ground." Trevor Johnston of Time Out gave the film four stars out of five, writing "It has enough of the right stuff to haunt the imagination long after the immediate buzz of its fluffy-furred cuteness has melted away. For a mere prequel, that's a result." Steven Rea of The Philadelphia Inquirer gave the film three stars out of four and said it "is cute, and funny, and the animation, though not exactly inspired, is certainly colorful." Jake Coyle of Associated Press gave the film three stars out of four, saying it "might not be as gifted as some of its other movies, but sometimes it's alright to be OK." Peter Travers of Rolling Stone gave the film three stars out of four, and said "It's all infectious fun, despite the lack of originality. In the art of tickling funny bones, Crystal and Goodman earn straight A's." Richard Corliss of Time gave the film a positive review, saying "This minor film with major charms still deserves to have kids dragging their parents to the multiplex for one more peek at the monsters in the closet. With Pixar, familiarity breeds content." Bill Goodykoontz of The Arizona Republic gave the film three-and-a-half stars out of five and said it is "one of those movies that has absolutely no reason to exist, but once you've seen it, you're kind of glad it does." Alan Scherstuhl of The Village Voice gave the film a positive review, saying "Monsters University feels not like the work of artists eager to express something but like that of likable pros whose existence depends on getting a rise out the kids. It's like the scares Sully and Mike spring on those sleeping tykes: technically impressive but a job un-anchored to anything more meaningful." Leonard Maltin of IndieWire praised the animation and art direction, but wrote that he wished "the movie was funnier and wasn't so plot-heavy" and that "Pixar has raised the bar for animated features so high that when they turn out a film that's merely good, instead of great, they have only themselves to blame for causing critics to damn them with faint praise." Michael Phillips of Chicago Tribune gave the film two stars out of four, saying "Monsters University, the weirdly charmless sequel to the animated 2001 Pixar hit Monsters, Inc., is no better or worse than the average (and I mean average) time-filling sequel cranked out by other animation houses." Todd McCarthy of The Hollywood Reporter gave the film a negative review, saying that it "never surprises, goes off in unexpected directions or throws you for a loop in the manner of the best Pixar stories. Nor does it come close to elating through the sheer imagination of its conceits and storytelling." Claudia Puig of USA Today gave the film three stars out of four, and said it "may not be as inventive as Inc., but it's an amusing and amiable addition to Pixar's roster of animated coming-of-age stories." Michael O'Sullivan of The Washington Post gave the film three stars out of four, saying "It may be children's terror that powers the movie's fictional universe, but it's the energy of its stars that lights up Monsters University." Chris Nashawaty of Entertainment Weekly gave the film an A− and said it "is exactly the rebound Pixar needed after 2011's Cars 2 left some wondering if the studio had lost its magic. The delightful story of when Mike met Sulley puts those concerns to rest." James Berardinelli of ReelViews gave the film three stars out of four and wrote "Although it falls short of the best Pixar has brought to the screen over its long association with Disney, it's nevertheless worth a trip to the theater, especially for kids." However, the film was not without its detractors. Richard Roeper gave the film a C+, saying "This is a safe, predictable, edge-free, nearly bland effort from a studio that rarely hedges its bets." Stephen Whitty of Newark Star-Ledger gave the film two-and-a-half stars out of four and said "The artwork is accomplished, and intricate. The G-rating is genuine, without any gross-out gags. And there's none of the usual winks to the adults with tired, pop-culture references." Manohla Dargis of The New York Times gave the film two-and-a-half stars out of five and wrote "Both the originality and stirring emotional complexity of Monsters, Inc., with its exquisitely painful and touching parallels with the human world, are missing." Ty Burr of The Boston Globe gave the film two-and-a-half stars out of four, and said "This is not a bad movie, and to small children it will be a very good one, but it's closer to average than one would wish from the company that gave us Up, WALL-E, The Incredibles, and the Toy Story series." Rene Rodriguez of Miami Herald gave the film two stars out of five and wrote that it "feels half-hearted and lazy, like they weren't even trying. At least show a little effort, guys." ^ "2013 Feature Film Production Report" (PDF). FilmL.A. 2014. p. 8. Archived from the original (PDF) on March 24, 2014. ^ a b c Belcastro, Joe. "Box Office Report: Monsters University schools The Heat and White House Down". Shockya. Retrieved July 8, 2013. ^ a b Johnson, Zach (December 12, 2013). "2014 Golden Globes Movie Snubs and Surprises: Oprah Winfrey, Leonardo DiCaprio and More!". E! Online UK. Retrieved March 24, 2014. ^ a b c "Monsters University (2013)". Box Office Mojo. Internet Movie Database. Retrieved August 20, 2016. ^ a b c Graser, Marc (April 22, 2010). "Disney drawing 'Monsters Inc.' sequel". Variety. Retrieved March 6, 2012. ^ a b Trumbore, Dave (May 10, 2013). "Producer Kori Rae Talks MONSTERS UNIVERSITY, Creating Pixar's First Prequel, Casting Helen Mirren, Crafting John Ratzenberger's Role and More". Collider.com. Retrieved May 10, 2013. ^ a b Jim Hill (August 7, 2005). "The Skinny on Circle Seven". Retrieved December 1, 2011. ^ a b c Armstrong, Josh (March 5, 2012). "Bob Hilgenberg and Rob Muir on the Rise and Fall of Disney's Circle 7 Animation". Animated Views. Retrieved June 27, 2013. ^ a b "Pixar announces 'Monsters Inc.' sequel is actually prequel". Entertainment Weekly. Retrieved December 9, 2013. ^ a b Chai, Barbera (January 7, 2013). "Watch an Exclusive Clip of Pixar's New Short, 'The Blue Umbrella'". The Wall Street Journal. Retrieved January 7, 2013. ^ "The Walt Disney Studios Shares Never-Before-Revealed Details About Upcoming Animation Titles with Fans at D23 Expo". D23.com. August 15, 2013. Retrieved November 21, 2014. ^ "The Story Behind the Story of Pixar's Party Central Short". Disney Insider. January 23, 2014. Retrieved November 21, 2014. ^ Smith, Grady (August 23, 2012). "'Monsters University': Billy Crystal explains the prequel's 'Revenge of the Nerds' connection". Retrieved October 8, 2012. ^ "'Monsters Inc.' prequel: Billy Crystal gets schooled by Pixar". Los Angeles Times. August 12, 2011. Retrieved March 5, 2012. ^ a b c d Eisenberg, Eric (August 20, 2011). "Monsters University Voice Cast And Plot Details Announced at D23". Cinema Blend. Retrieved March 6, 2012. ^ O'Hara, Helen (February 11, 2013). "Helen Mirren Set For Monsters University". Empire. Retrieved February 12, 2013. ^ a b c Rizvi, Samad (February 12, 2013). "New 'Monsters University' Characters Revealed, Sean Hayes and Charlie Day Join Cast". Pixar Times. Retrieved February 20, 2013. ^ Roahrig, Maxwell (May 8, 2012). "Flixclusive: Joel Murray talks Monsters University". Flixist. Retrieved May 10, 2012. ^ Risley, Matt (February 20, 2013). "Exclusive: Meet the class of Monsters University". Total Film. Retrieved February 20, 2013. ^ Reynolds, Simon (February 21, 2013). "'Monsters University' unveils character posters, ID cards". Digital Spy. Retrieved February 21, 2013. ^ a b c d e f g h i Rome, Emily (April 16, 2013). "Nathan Fillion, Bonnie Hunt, John Krasinski, more voice cast revealed for Pixar's 'Monsters University' – EXCLUSIVE". Entertainment Weekly. Retrieved April 16, 2013. ^ a b Dargis, Manohla (June 20, 2013). "A College Where the Exams Are Terrifying". The New York Times. Retrieved June 22, 2013. ^ Galuppo, Mia (June 18, 2013). "'Monsters University' Premiere: Cast Graduates From the School of Pixar". The Hollywood Reporter. Retrieved June 21, 2013. ^ "Monsters University Pushed to 2013". movieweb.com. April 4, 2011. Retrieved April 4, 2011. ^ Saperstein, Pat (April 23, 2013). "'Monsters University' to Open Annecy Toon Fest". Variety. Retrieved June 30, 2014. ^ "John Lasseter Talks CARS 2, BRAVE and the Future of Pixar". Collider. Retrieved May 29, 2011. ^ "Pixar Short Director Dan Scanlon Set to Helm 'Monsters University'". First Showing. Retrieved April 1, 2011. ^ Lesnick, Silas; Murphy, Matt (August 20, 2011). "D23 Expo: Director Dan Scanlon Talks Monsters University". ComingSoon. Retrieved August 21, 2011. ^ Brandom, Russsel (June 21, 2013). "Throwing shade: how Pixar changed the way light works for 'Monsters University'". The Verge. Retrieved June 23, 2013. ^ Desowitz, Bill (May 2, 2013). "Shining a New Light on Pixar". Animation World Network. Retrieved June 24, 2013. ^ "Monsters University – Fun Facts!". Kidstvmovies.about.com. July 15, 2013. Retrieved August 16, 2013. ^ a b "Monsters University: 5 Things You Should Know to Be Too Ghoul for School | E! Online UK". E!. June 23, 2013. Retrieved August 16, 2013. ^ Michael Strong (April 16, 2013). "Pixar Goes to College: A Monsters University Preview | KSU". Ksusentinel.com. Retrieved August 16, 2013. ^ "Walt Disney Records to Release Soundtracks for 'The Lone Ranger' and 'Monsters University'". Film Music Reporter. March 20, 2013. Retrieved April 22, 2013. ^ "Monsters University [CD + Weblink]: Music". Amazon.com. February 6, 2013. Retrieved May 30, 2013. ^ "Blue Devils Press Release". Archived from the original on October 29, 2013. Retrieved September 17, 2013. ^ "Blue Devils Staff Page". Archived from the original on October 29, 2013. Retrieved September 17, 2013. ^ Matt Goldberg (June 20, 2012). "Four Teaser Trailers and Six Images for Pixar's MONSTERS UNIVERSITY [Updated]". Retrieved June 26, 2012. ^ Hall, Jacob (April 1, 2013). ""Monsters University" Website Gets Hijacked for April Fool's Day". Screen Rush. Retrieved April 6, 2013. ^ Billington, Alex (April 1, 2013). "Fear Tech Rulz! 'Monsters University' Website Defaced by Rival School". FirstShowing.net. Retrieved April 6, 2013. ^ "and... Pixar!". Club Penguin. Retrieved June 21, 2013. ^ "June 2013 at BFI Southbank" (PDF). British Film Institute. May 2, 2013. Retrieved June 5, 2013. ^ a b Tsui, Clarence (June 4, 2013). "'Monsters University' to Open Shanghai Festival". The Hollywood Reporter. Retrieved June 5, 2013. ^ Sluss, Justin (August 9, 2013). "Pixar's "Monsters University" comes to Blu-ray and Blu-ray 3D in October". High Def Disc News. Archived from the original on August 12, 2013. Retrieved August 9, 2013. ^ Mike Fleming Jr (March 21, 2014). "2013 Most Valuable Blockbuster – No. 7 'Monsters University' Vs. No. 10 'Thor: The Dark World'; #2 'Frozen' Vs. #15 'The Great Gatsby'". Deadline Hollywood. Retrieved March 22, 2015. ^ "All Time Worldwide Box Office Grosses". Box Office Mojo. Internet Movie Database. Retrieved October 28, 2013. ^ "Pixar Movies at the Box Office". Box Office Mojo. Internet Movie Database. Retrieved October 28, 2013. ^ "All Time Worldwide Opening Records". Box Office Mojo. Internet Movie Database. Retrieved October 28, 2013. ^ a b Grady Smith (June 23, 2013). "Box office report: 'Monsters University' scares up $82 million, 'World War Z' shatters expectations". Entertainment Weekly. Retrieved June 23, 2013. ^ Pamela McClintock (June 19, 2013). "Box Office Preview: 'Monsters University' Pacing to Beat 'World War Z'". The Hollywood Reporter. Archived from the original on June 21, 2013. Retrieved June 21, 2013. ^ Pamela McClintock, Rebecca Ford (June 21, 2013). "Box Office Report: Brad Pitt's 'World War Z' Opens to $3.6 Million Thursday Night". The Hollywood Reporter. Archived from the original on June 21, 2013. Retrieved June 21, 2013. ^ Grady Smith (June 22, 2013). "Box office update: 'Monsters University' and 'World War Z' have scary good Friday; 'Man of Steel' sinks". Retrieved June 22, 2013. ^ a b "Weekend Report: 'Monsters' and Zombies Both Win On Busy Weekend". Box Office Mojo. June 23, 2013. Retrieved June 24, 2013. ^ "Biggest Opening G Rated Movies". Box Office Mojo. Internet Movie Database. Retrieved October 25, 2013. ^ "Prequel Movies". Box Office Mojo. Internet Movie Database. Retrieved October 25, 2013. ^ "Animation Movies (sorted by Opening)". Box Office Mojo. Internet Movie Database. Retrieved October 25, 2013. ^ "Top June Opening Weekends". Box Office Mojo. Internet Movie Database. Retrieved October 25, 2013. ^ "Weekend Report: 'Monsters' Repeats, 'Heat' Sets Fire to 'White House'". Box Office Mojo. June 30, 2013. Retrieved July 1, 2013. ^ "Weekend Report: 'Despicable' Defeats 'Ranger' Over Busy Fourth of July". Box Office Mojo. July 7, 2013. Retrieved July 17, 2013. ^ "Animation Movies". Box Office Mojo. Internet Movie Database. Retrieved October 19, 2013. ^ Agustin Mango (June 24, 2013). "'Monsters University' Marks Disney/Pixar's Top Latin America Opening". The Hollywood Reporter. Archived from the original on June 26, 2013. Retrieved June 26, 2013. ^ Gill, David (July 15, 2013). "Disney•Pixar's 'Monsters University' Breaks Records in Latin America". Disney Post. Retrieved August 21, 2013. ^ "Argentina Box Office, June 20–23, 2013". Boxofficemojo.com. Retrieved February 15, 2014. ^ "Australia Box Office, June 20–23, 2013". Boxofficemojo.com. Retrieved February 15, 2014. ^ Ma, Kevin (July 12, 2013). "Monsters sets Hong Kong animation record". Film Business Asia. Archived from the original on October 19, 2013. Retrieved July 14, 2013. ^ Chu, Karen (July 15, 2013). "'Monsters University' Breaks Another Hong Kong Box Office Record". The Hollywood Reporter. Retrieved August 20, 2013. ^ "'Monsters University' beats 'Despicable Me 2' at UK box office – Movies News". Digital Spy. June 27, 2013. Retrieved July 20, 2013. ^ "GLOBAL: The Minions Take Over The World With $805.8M Total". boxoffice.com. August 25, 2013. Archived from the original on November 5, 2013. Retrieved August 25, 2013. ^ a b "Monsters University (2013) – International Box Office Results". Box Office Mojo. Internet Movie Database. Retrieved October 25, 2013. ^ "Monsters University (2013)". Rotten Tomatoes. Fandango Media. Retrieved April 19, 2019. ^ "Monsters University Reviews". Metacritic. CBS Interactive. Retrieved March 5, 2018. ^ Zoller, Matt (July 10, 2013). "Monsters University Movie Review (2013)". Roger Ebert. Retrieved July 20, 2013. ^ Trevor Johnston (July 12, 2013). "Monsters University | Time Out London". Time Out. Retrieved July 20, 2013. ^ Steven Rea, Inquirer Movie Columnist and critic. "'Monsters University' gives it the old college try". Philadelphia Daily News. Retrieved July 20, 2013. ^ Coyle, Jake. "Review: 'Monsters University' gets a passing grade". Associated Press. Retrieved July 20, 2013. ^ Travers, Peter. "Peter Travers Reviews 'Monsters University' | Movie Reviews". Rolling Stone. Retrieved June 21, 2013. ^ Corliss, Richard (June 13, 2013). "Movie Review: Pixar's 'Monsters University' – When Hairy Met Scary". TIME. Retrieved July 20, 2013. ^ Bill GoodyKoontz (June 19, 2013). "'Monsters University,' 3.5 stars". The Arizona Republic. Retrieved August 16, 2013. ^ Alan Scherstuhl (June 19, 2013). "Pixar Bangs Out More Superior Kids Fare with Monsters University, And Nothing More – Page 1 – Movies – New York". The Village Voice. Retrieved August 16, 2013. ^ "Monsters University – Leonard Maltin – Blogs – Indiewire". Leonard Maltin. IndieWire. Archived from the original on October 29, 2013. Retrieved August 29, 2013. ^ Michael Phillips (June 20, 2013). "Monsters University movie review by Chicago Tribune's Michael Phillips". Chicago Tribune. Archived from the original on October 29, 2013. Retrieved June 21, 2013. ^ McCarthy, Todd (June 9, 2013). "Monsters University Review". The Hollywood Reporter. Retrieved June 21, 2013. ^ Claudia Puig (June 20, 2013). "It won't make honor roll, but 'Monsters University' easily passes". USA Today. Retrieved June 21, 2013. ^ Michael O'Sullivan (May 23, 2013). "'Monsters University' movie review". The Washington Post. Retrieved June 21, 2013. ^ Chris Nashawaty (May 30, 2013). "Monsters University Movie Review | Summer Movies – Calendar, Trailers, Movie Photos, Movie Clips, Movie Guide". Entertainment Weekly. Retrieved June 21, 2013. ^ "Reelviews Movie Reviews". Reelviews.net. June 21, 2013. Retrieved August 16, 2013. ^ "Monsters University Review". RichardRoeper.com. Retrieved July 20, 2013. ^ Stephen Whitty (June 20, 2013). "'Monsters University' review: Pixar gets a passing grade". The Star-Ledger. Retrieved July 5, 2013. ^ Dargis, Manohla (June 20, 2013). "A College Where the Exams Are Terrifying". The New York Times. Retrieved September 17, 2013. ^ Rodriguez, Rene (June 20, 2013). "'Monsters University' (G)". miami.com. Retrieved August 16, 2013. ^ Giardina, Carolyn (January 10, 2014). "'12 Years a Slave,' 'Captain Phillips,' 'Gravity' Among ACE Eddie Award Nominees". The Hollywood Reporter. Retrieved December 11, 2013. ^ Jagernauth, Kevin (December 2, 2013). "'Frozen' & 'Monsters University' Dominate Annie Awards Nominations With 10 Each". Indiewire. Archived from the original on December 3, 2013. Retrieved December 2, 2013. ^ Derks, David (December 2, 2013). "41st #AnnieAwards Nominations Announced". ASIFA-Hollywood. Retrieved December 2, 2013. ^ "Film in 2014". Retrieved January 8, 2014. ^ "Cinema Audio Society Unveils Nominations for the 50th Annual CAS Awards". Deadline. January 14, 2014. Retrieved January 14, 2014. ^ The Deadline Team (February 22, 2014). "Cinema Audio Society Awards: 'Gravity', 'Frozen' Take Film Honors". Deadline. Retrieved February 23, 2014. ^ "19TH ANNUAL CRITICS' CHOICE MOVIE AWARDS NOMINATIONS". Critics' Choice. December 17, 2013. Retrieved December 17, 2013. ^ Feinberg, Scott (September 11, 2013). "Hollywood Film Awards to Honor 'Monsters University' and 'Pacific Rim' (Exclusive)". The Hollywood Reporter. Retrieved December 8, 2013. ^ Joey Magidson (January 13, 2014). "International cinephile society nominations". Awardscircuit. Retrieved February 23, 2014. ^ Ng, Philiana (February 24, 2014). "Nickelodeon's Kids' Choice Awards Nominations Revealed". The Hollywood Reporter. Retrieved February 25, 2014. ^ "Nominations for Theatrical Motion Picture, Animated Theatrical Motion Picture and Long-Form TV". producersguild.org. January 2, 2014. Retrieved January 2, 2014. ^ Stone, Sasha (December 13, 2013). "San Francisco Film Critics Nominations". Awards Daily. Retrieved December 13, 2013. ^ Kilday, Gregg (December 2, 2013). "Satellite Awards: '12 Years a Slave' Leads Film Nominees". The Hollywood Reporter. Retrieved December 2, 2013. ^ Pond, Steve (January 14, 2014). "'Gravity' Soars in Visual Effects Society Nominations". The Wrap. Retrieved January 14, 2014. ^ Tapley, Kristopher (December 8, 2013). "'12 Years a Slave' and 'Her' lead the way with Washington D.C. critics nominations". Hitfix. Retrieved December 8, 2013. Wikimedia Commons has media related to Monsters University.